Its me again! I wish I had more time to tat! I see people in the group Just-Tatting on Facebook posting multiple times daily. How do they find the time? I had planned on tatting all day today and starting another heart for the “Tatting From the Heart Contest” at our upcoming tatting workshop but chose to cook and bake instead to make my husband happy. Mistake, I should have tatted instead, would have been more satisfying, ha, ha. How often do you get a chance to tat? Daily? Every few days? Constantly? Back to the hearts, I have gotten a few done. My first time tatting with buttons which is a nice look. I also have a metal filigree I want to tat onto. So many possibilities! 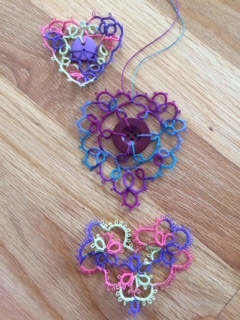 Have you been tatting hearts for the tatting contest at our workshop? So I had this great idea of learning interlaced rings in order to make a bracelet. Wow, I have a lot to learn, plus I could use a few more fingers, ha, ha. You would never know that this bit of tatting took me an evening and part of the next day! My thanks to Muskaan’s T*I*P*S at http://www.tipsaroundthehome.blogspot.in/2014/11/how-to-start-interlaced-rings.html for her great tutorial or I would have never gotten the hang of it! I will put this in my toolbox of ideas and get back to the bracelet later as I want to work on hearts for our Shuttlebirds Tatting Workshop which is in April. Another version of interlaced rings is from Frivolite. I think I actually like this one a bit better as I did not need quite so many fingers. Actually, it was pretty easy to do with the help of the YouTube video located at https://www.youtube.com/watch?v=8ESsbFva82Q.